William has a friend named, Zane, and he is one of my favorite kids on earth. He speaks his mind, loves babies, and gyrates like nobody's business. William loves him. We see him almost every day and yet he asks me nearly every morning, "Hey Mom! Remember Zane?" Yep, he is one of William's favorite kids ever and it makes me so sad that we won't be in San Diego anymore for them to play - besides, his mom is one of my favorite people ever too so it's a double dose of sadness. The other day I watched Zane while his mom ran an errand. He and William were running around the house, being hilarious, and so I decided to channel that energy and have a dance party. William loves Gangnam Style so I turned it on and proceeded to crack up while I took this video. Zane has serious dance moves. Another thing about Zane is that he has no fear - and I mean none. He climbs on things like a monkey and pushes physical limits. I'm pretty sure Lela is going to have many premature gray hairs from his antics - but he's just so sweet! He's not defiant, just active! Yesterday they were at our house and the boys were playing in the backyard. Zane was riding down the slide on a push cart (oh, boys!) and slipped and cracked his head open on a terracotta pot. Blood gushed everywhere - and I mean everywhere. I freaked out and ran around the house looking for towels and a phone to call 9-1-1 all while trying not to pass out or hyperventilate. I was really worried (I don't do well with blood) but I marveled at Lela. She was so calm and composed the whole time. She whisked him up, asked me for a towel, applied pressure, kept him awake and observed the damage all while comforting him and making sure he didn't see her concern. She is such a great mom and I want to be like her when I grow up. 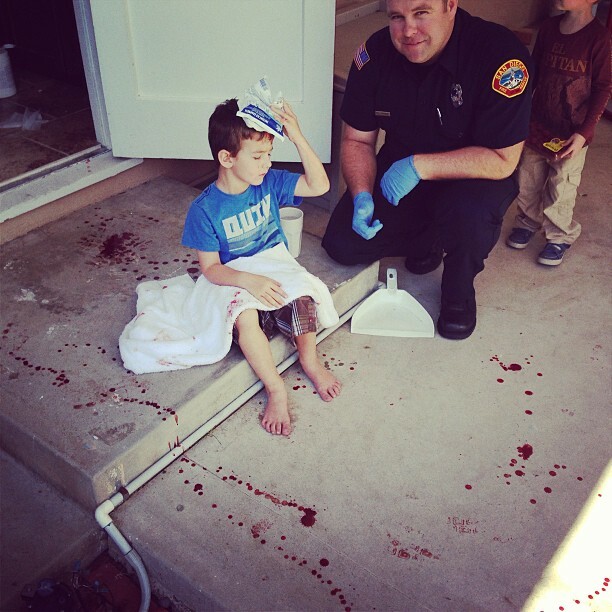 Once the paramedics came, William went inside and kept offering Zane raspberries and asking the firemen, "Zane got a hurt?" He was very concerned for his best buddy. We love Zane and it looks like he'll be OK! A few staples and stitches later and he's right as rain. He was pretty excited about showing everyone his stitches and battle wounds. So relieved that he's going to be alright! I want to be like Lela when I grow up too! I am 100% sure I would have totally freaked out, been bawling, etc. I want so bad to be the kind of person who is calm in situations like that, but I'm definitely not. So so glad Zane is ok! Byron said the guys were joking last night that Sean should sue you guys... I said sue the landlord and you can split the profits... haha. How scary! Ah! I hate blood. and that kid has some mean dance moves! That is so scary! I wish I were calm in situations like that, but I'm more like you. Lela seems like such an awesome lady! Glad he is okay! !